Among those who attended the recent scholarship dinner are, from left to right, San Miguel Academy graduate and Marvelwood student Axel Juarez, Sandy Singco, chair of the Learning Support Department at Marvelwood School, Father Mark Connell, founder and executive director at San Miguel Academy of Newburgh, Maureen Smith, associate director of admissions at Marvelwood School and Avante Walker, San Miguel Academy graduate and Marvelwood student. 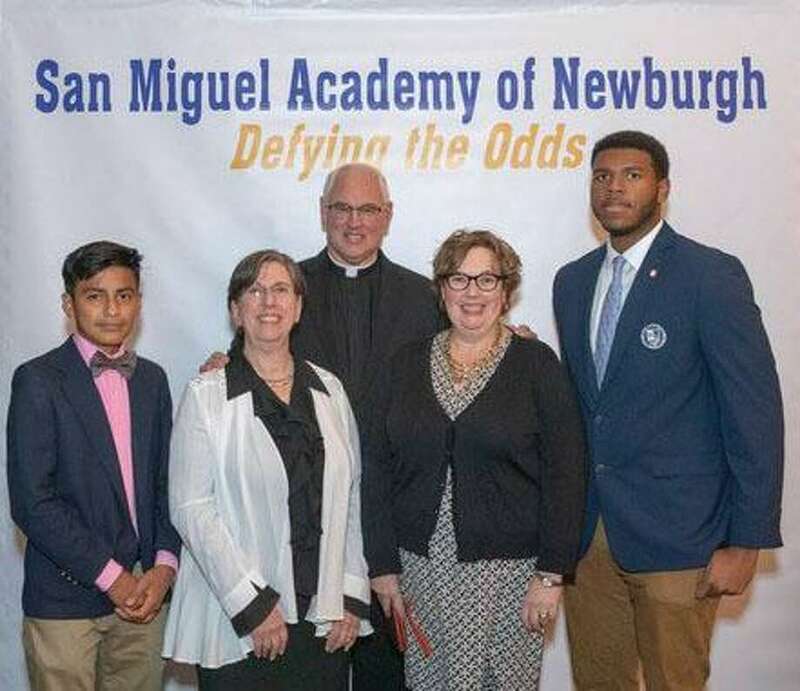 Students and staff of Marvelwood School in Kent recently attended the “Defying the Odds Dinner” in support of San Miguel Academy of Newburgh, N.Y. The scholarship dinner, held at the Westchester Country Club on Oct. 25, was attended by members of the Marvelwood community and graduates of San Miguel Academy. Marvelwood School is an educational partner of San Miguel of Newburgh’s Graduate Success Program, which provides students high school options after graduation. San Miguel Academy of Newburgh, a tuition-free, faith-based school for boys in fifth through eighth grade, is celebrating its 12th year. The school’s, whose mission is breaking the cycle of poverty through education, provides some of Newburgh’s most economically challenged students, and those often forgotten in a large urban school setting, the ability to participate in an educational experience that can redirect and reshape their future. By working with middle school young men, San Miguel has proven to be a stepping stone to high school and college.